程睿, 付士红, 范娜, 何英, 雷雯雯, 王环宇, 王斌, 鲁晓晴, 梁国栋. 中华按蚊分离的版纳病毒全基因组序列测定与分子遗传进化分析[J]. 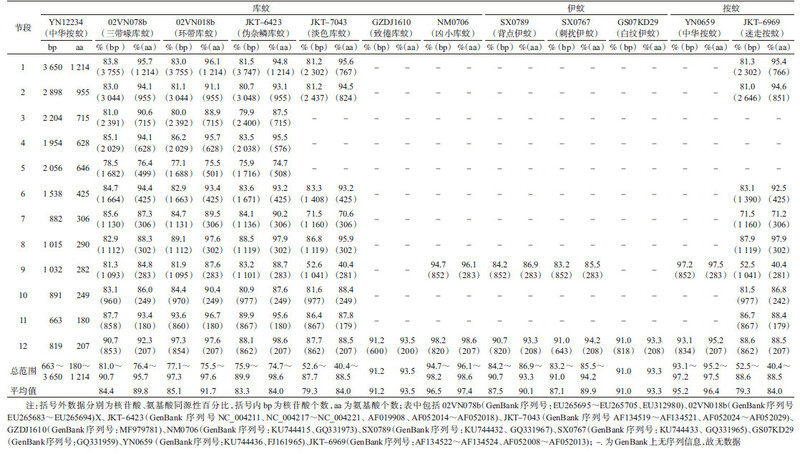 中国媒介生物学及控制杂志, 2018, 29(6): 550-556. CHENG Rui, FU Shi-hong, FAN Na, HE Ying, LEI Wen-wen, WANG Huan-yu, WANG Bin, LU Xiao-qing, LIANG Guo-dong. 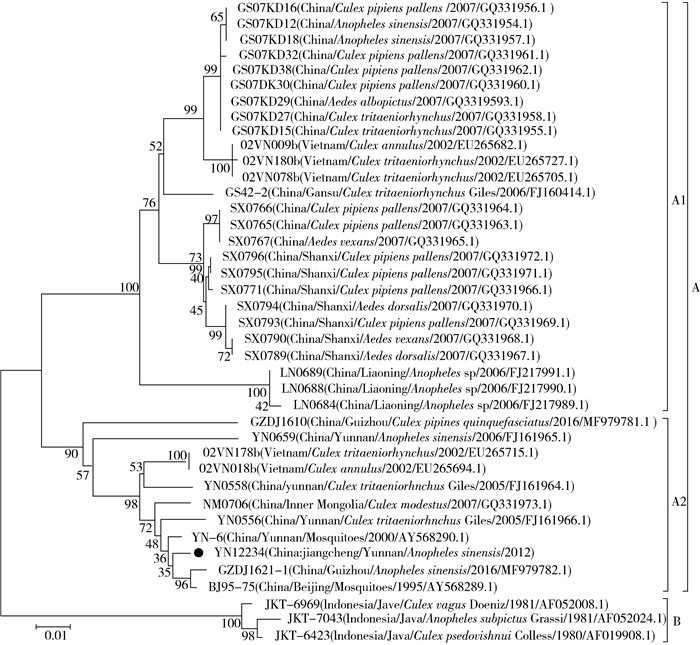 Genome sequencing and phylogenetic analysis of Banna virus (genus Seadornavirus, family Reoviridae) isolated from Anopheles sinensis[J]. Chin J Vector Biol & Control, 2018, 29(6): 550-556. Corresponding author: LU Xiao-qing, Email: Luxq532@126.com; LIANG Guo-dong, Email: gdliang@hotmail.com. Abstract: Objective To determine the whole genome nucleotide sequence and carry out molecular genetic analysis of Banna virus (BAV) isolated from Anopheles sinensis. Methods The 12-segment nucleotide sequence of BAV was determined by molecular virological methods. Sequence alignment, homology, and molecular phylogenetic analysis were performed by using bioinformatics software. Results The BAV isolated from An. sinensis (YN12234 strain) caused cytopathic effect (CPE) and stable passage in C6/36 cells. The virus was composed of 12 segments of double-stranded RNA (dsRNA). 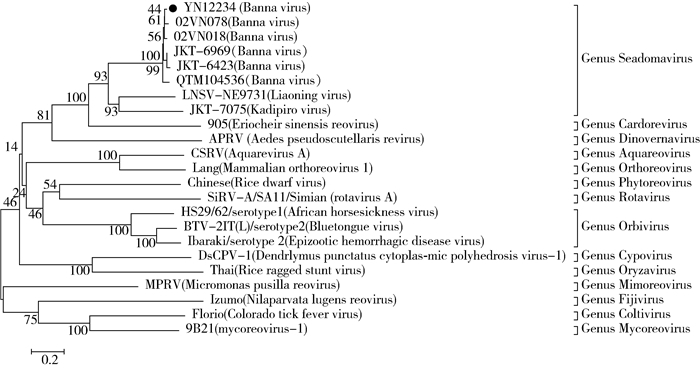 Phylogenetic analysis of the viral VP1 protein (RdRp) amino acid sequence revealed that the YN12234 virus belongs to BAV of genus Seadornavirus of family Reoviridae. Further analysis of the 12th segment of the gene sequence revealed that the YN12234 virus belongs to the BAV genotype A2. The results of phylogenetic analysis also showed that the BAV isolated from An. sinensis in this study was in a different evolutionary branch from the BAV previously isolated from An. sinensis, and the BAV isolated from different mosquitoes was located in the different evolutionary cluster. Conclusion The YN12234 strain isolated from An. sinensis belongs to the BAV with 12 segments. The results of molecular evolution analysis suggest that vector adaptability between virus and mosquito species does not exist for the BAV isolated from the mosquitoes at home and abroad, including the YN12234 virus isolated in Yunnan province. 刘红, 梁国栋. 版纳病毒及其感染[J]. 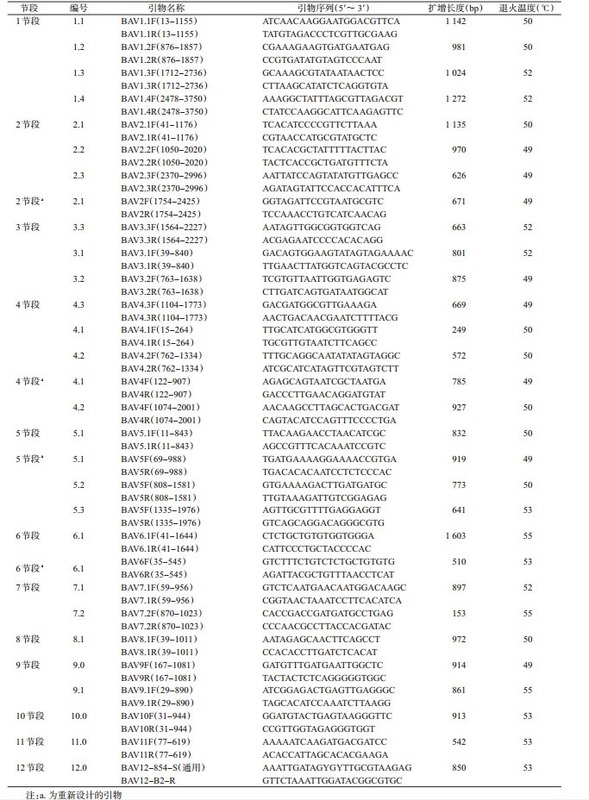 中国媒介生物学及控制杂志, 2010, 21(5): 502-504. 杨杜鹃, 付士红, 张海林, 等. 云南省东北等地区蚊虫及蚊媒病毒调查研究[J]. 中国媒介生物学及控制杂志, 2011, 22(4): 304-308, 312. 张照英, 高再发, 熊晓霞. 输入性登革热合并疟疾两例调查处理报告[J]. 公共卫生与预防医学, 2009, 20(6): 75-76.